In a medium non-stick pan, melt the butter. Add the brown sugar and stir over medium-low heat until the sugar has completely dissolved. Add the almonds and stir to coat. Pour the almonds onto a piece of parchment paper or foil and quickly spread and separate into an single layer. Allow the almonds to cool completely. Once cool, break the almonds into bite-size pieces; set aside. In a small bowl, combine the vinegar, Dijon, and sugar. Using a wire whisk, add the oil and whisk until emulsified. Add the shallot and stir until combined. In a large bowl, toss the apples and lemon juice together. Add the cabbage and cranberries; toss again. Pour in the vinaigrette; mixing well. Add the candied almonds and cheese, if using, and toss until combined. Season to taste with salt and freshly ground black pepper. Enjoy! LOVE all the fun flavors in this salad :) Perfect for the holidays too. What a great fall salad! 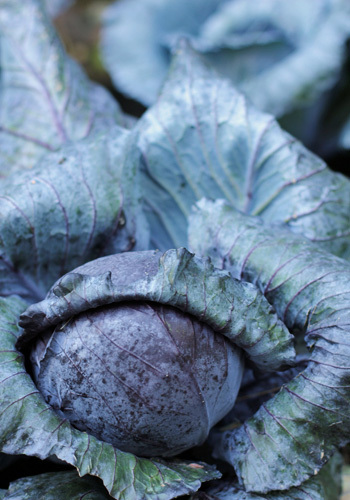 Love the combination of cabbage and apples and then you add all of those other wonderful ingredients! I especially love the candied apples. I've saved this one for sure! Nicole - Is the sugar measurement in this vinaigrette correct on this recipe? Seems like it should be more than 1/4 teaspoon? I just made this and loved it, but thought it needed to be a bit sweeter... I do like sweet slaw so it could just be me! Thought I would double check with you. Thanks. Yes, it is the correct measurement and I am glad you enjoyed it. 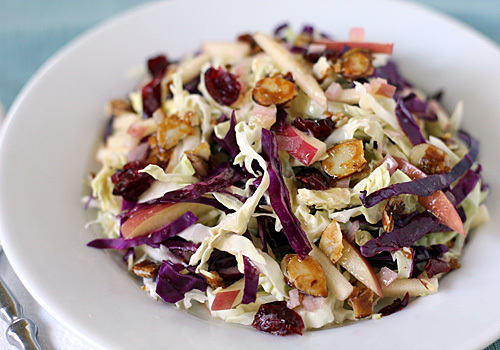 I appreciate a sweet slaw as well, but in this recipe I like the sweetness from the apples and cranberries to come through for a nice sweet and savory combo. I always say make it for you , make it your own. Having said that, adjust according to your own taste☺.